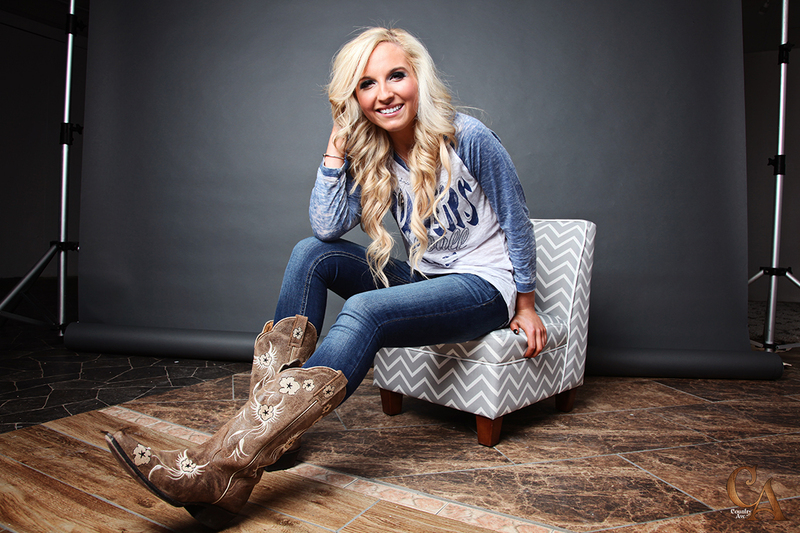 At 18, Jessie Chris has already achieved a lot in the world of Country Music. After performing lots of gigs and even opening for Country heartthrob Luke Bryan, her star is on the rise. Chris sat down with me to answer questions about her music and where she's headed next. Her performance beginnings started when she was five and by her parents, as Chris explains. "my love for music and being on stage started when I was five years old – my parents forced me to audition for the community play, it was The Wizard of Oz and I was a munchkin. I was 5 years old so I was the size of a munchkin". She was soon bitten by the performance bug and "obsessed with the 30 seconds I got to be on stage". After getting into theatre, her obsession with playing music was ignited at age ten and by her brother. "My brother got a guitar for Christmas and a ‘Learn to play’ DVD and he gave it a try and he was like 'I hate this, it’s stupid, it’s so hard' and I was like 'that looks so fun' so I got my first guitar when I was ten, and it just kinda went from there." Since then she's opened for artists including Hannah Montana star Billy Ray Cyrus, an experience she looks back on with a big smile. "[it] was the coolest thing ever. I grew up watching him on Hannah Montana so when I met him I was like 'I feel you're my dad!" but it was weird - I felt like I had known him my whole life and I was nervous. He was so down-to-earth and genuinely kind". Her positivity about Cyrus didn't end there, as they "got to sing together, we sung 'Achy Breaky Heart' and it was really fun, he's a really cool guy to talk to". Her debut album Wildfire was released in 2015 and was recorded in Nashville (Country music capital of the World), where Chris admits she was a bit starstruck in the studio, as she "was walking around the studio looking at their Wall of Fame and who had recorded there – there was Taylor Swift, Faith Hill, Tim McGraw, so I was just drooling at all the artists that had recorded there." That inspiration led to great feedback from her audience, as "I get a lot of responses that people are relating to the songs and that they really enjoy them, and all different ages too – people reach out to me with young daughters that are five years old and singing my songs, some people who are my parents’ age reach out and are like ‘I’m obsessed'". Chris' CMA (Country Music Association) Fest performance couldn't have been timed or gone any better, as it was "4 days after I graduated from high school. It was really exciting and the whole week was just a whirlwind – it happened so fast and it was just so crazy." Did she learn a lot from seeing more seasoned performers on the stage and it being first time playing in Nashville? "I did learn a lot from watching other people play, I was so nervous that maybe people would think I’m not as good or just maybe not respect me. But everyone – musicians, fans – were just so welcoming and accepting and it was not what I feared it would be, it was a million times better, it was just a really incredible stepping stone." Chris was also picked to be in the final 4 of the William Morris Showcase, something she was anxious to take part in. "Everyone was else was like 10 years older than me so they obviously had a lot more experience. I guess there were a lot of industry people in the audience but I told my manager Jeff I’m like 'don’t even tell me who’s there, I can’t know until after'. When choosing what to play for the showcase, she decided to play original songs instead of covers, "as each artist got twenty minutes and if you only given twenty minutes you want to show them your best stuff." With all of Chris' great achievements, what's her proudest? "I would say the album. That was a personal goal from a really young age, and when I was a really little girl I had this dream ‘one day I’m gonna have my own original song and it’ll be my song'. For me that was really rewarding as I thought it was something I would never do." In terms of what's next for Jessie Chris, it's more performances as "I actually leave this weekend for New York City, I’m going to visit XM Radio there and I have a couple other meetings in the city. Then I’m going straight from New York City to Washington D.C. and to the Walter Reid hospital with wounded soldiers and I get to sing to them as well as playing another show in D.C. Then after that it’s off to Richmond, Virginia to play on a couple TV and radio stations so I’m really excited about that." So big things comings from this small name, I'm excited to see them and you should be too. Thanks to Jessie Chris for answering my questions. You can follow her on Instagram, Twitter and Facebook to see what she's up to and don't forget to follow me on Twitter, 'Like' my Facebook page and follow me on Bloglovin' to get notified about my posts before anyone else.